At Delaware State, halftime is “show time”. That’s because the university’s popular marching band, “The Approaching Storm” takes center stage. 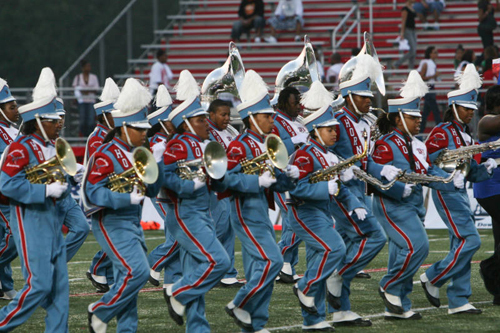 The DSU band is a high-energy, high-stepping, entertaining collection of talented musicians and dancers. In 1995, the DSU band performed in England at the London New Year’s Day parade. A 1998 jazz band tour of Europe featured performances in Germany, Belgium and The Netherlands. The “Storm” is a popular guest at National Football League stadiums, including three Philadelphia Eagles contests. The band has also appeared at New York Giants, Washington Redskins and Buffalo Bills home games. In 2006, the “Storm” stole the show during the Fourth Annual Ford Football Classic at Ford Field, home of the NFL’s Detroit Lions and the site of Super Bowl XL. Known throughout Delaware for its distinctive style, the “Storm” is a popular attraction at parades and celebrations throughout the state.